Japan England Insurance Brokers Limited (JEIB) was the first Japanese Insurance Broking company to be established in the London Insurance market. We started business in 1986 as a joint venture of Japanese and British private and corporate investors. Our expertise and stature, particularly in the Japanese business community, has been well proven, and we can provide a high level and quality of service in English and Japanese for companies of any standing. We would be very pleased to discuss your insurance requirements with you and, if appropriate, to carry out a strictly confidential review of your current insurance arrangements at no cost or obligation to you. Even with a well-planned risk management program in place, disasters can occur at any time, and statistics show that half of companies which have suffered large losses from fire have suspended business, even if it is just for a short term period. 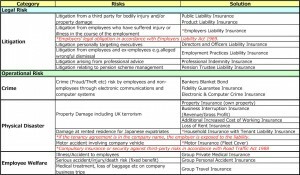 Analysing your risk and setting up a risk management program is a key to your business. And we would be pleased to discuss your insurance requirements with you at no cost or obligation to you. 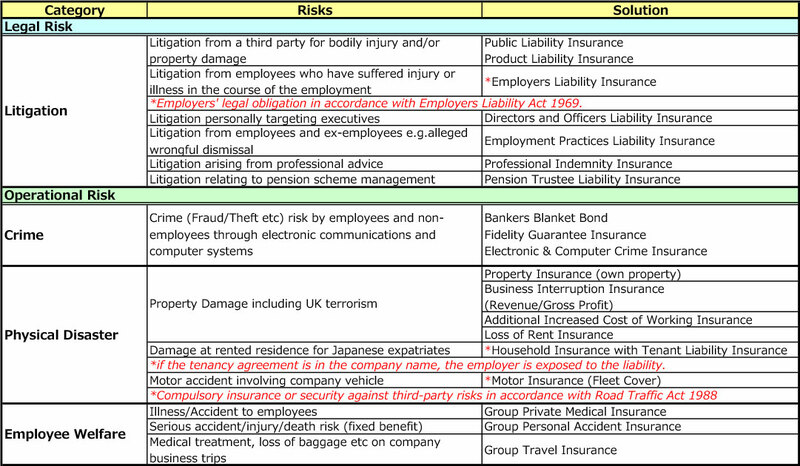 Download “Example of Insurance Risks” chart.